First off….compiling any lists of stats after only two matches of play is to not be taken too seriously. A few moments of glory sees you shoot to the top of the charts. How sustainable any of these results will be will be very much open to debate. A statistical rating unique to the site called Offensive Statistical Contribution Rating (OSCR), is an attempt to create a single number that rates a player’s offensive impact on his team’s chances of winning matches. Normally this stat should be isolated to single matches but as the season goes on a per 90 minute average will be a nice barometer of a player’s value to his team. How is this rating generated? Remember the objective is to see what players’ had the biggest offensive impact on a team’s chances of winning. What win football matches? Goals. So scoring a goal is the baseline number, while the passes that set up the goal also have added value. How do teams score goals? By creating shots, so the passes that lead up to shots have a value & obviously the actual shot is included. If that shot is on target, the shooter gets another bump in his rating. Not all shots are created equally, so the better the chance is…the more value it has in the rating. The original breakdown of OSCR can be found in this post from last season. But yeah, we only have two weeks of football to look at…..so let’s see who has the highest rating so far this season. Leigh Griffiths has only played 95 minutes of league football so far this season & leads the league in total OSCR. He also leads in Expected Goals with 2.05, which is aligned with his actual total of goals. On top of that, he is tied in the league lead for shots (with Josh Windass). Did I say he’s only played 95 minutes so far? Michael O’Halloran has only played a few more minutes than Griffiths & he clearly has had the biggest impact on St. Johnstone’s undefeated start to the season, scoring three goals on three shots. 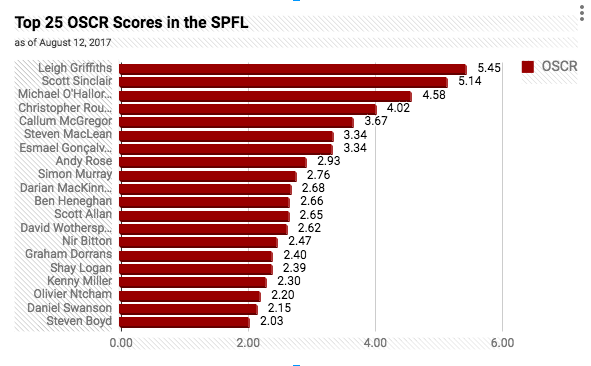 Christopher Routis of Ross County ranks just below the top three despite ‘only’ scoring one goal. But he has steadily impacted the first two games with a total of five shots, an assist & five shot creation passes (combined Key Passes, Secondary Shot Assists, & Establishing Passes). Esmael Goncalves has been one of the only positives coming out of Hearts muted start to the season. All three of his shots have been on target & two have been goals. Scott Allan is the highest rated player to not actually have scored a goal this season. He has eight shot creation passes, his 1.41 xG Chain is the 4th highest total in the league, & his 1.00 Expected Assists is also the fourth highest. Graeme Dorrans is the highest rated Rangers player followed by Kenny Miller, Alfredo Morelos (1.90), Daniel Candeias (1.67), & James Tavernier 1.63. Eduardo Herrera is ranked 121st in the league with an OSCR of 0.21. Again, it’s only been two weeks.